Send the gift of heavenly Godiva® chocolate sweets! A stunning ivory metal basket with gold embossing is brimming with luscious Chocolate Truffles, Milk Caramel Chocolates, Milk Chocolate Pretzels, Chocolate Cocoa and much more! Beautifully wrapped with a lavender Godiva® ribbon. 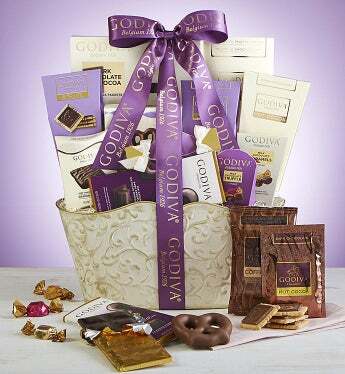 Send this sweet basket to the sweetest person you know!